Racism is a common practice in today’s world. It exists in our society and children experience racial discrimination in various forms. Some people are called black and others; white. Why it is so? The word race is considered a taboo in our society and it is the hardest task for parent to talk to kids about race. It is natural that parents want to protect their kids from harsh realities of life. It is very important for you as a parent that you converse with your child about race and racism. Staying silent about racism is not a good thing. But how it is possible to talk to the kids about racism without making him oversensitive about it? Colorblindness can be its solution but I think our society is too far from colorblindness. 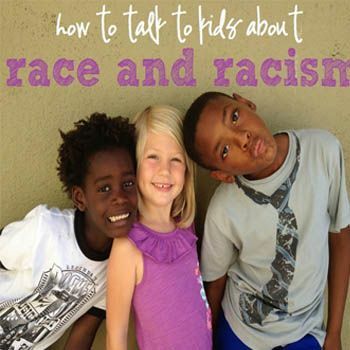 Have you decided to talk to your kids about racism and are now thinking about where to begin the discussion from? Children begin to spot differences at the age of 3 and after that they start making judgments about people belonging to different race. I recommend you to start discussion at the age of 3. First of all, you have to check yourself whether you are unbiased or not. What kind of remarks do you make about racial groups? You can’t raise anti-racism in your kids unless your own biases are left unchecked. Children follow the values and behaviors of their parents. If you want to teach your kids about racism then you must be their role model to begin with. You can take them to cultural events that take place all the year. This is an ideal way to introduce different cultures and their values to your kids. It’s a great beginning which not only gives chance to learn about other cultures and backgrounds but also an opportunity to mingle with folks from all sorts of backgrounds. Try to identify and clarify all the cultural differences. Sometimes children become the victim of racism and face rejection on the basis of race and get targeted by racial discrimination. As a parent, it is up to you how to make your kid realize this all. Encourage positive aspects in your kid. Put a strong foundation regarding racism. Make them strong enough to tolerate other comments and handle the situation himself. You can empower your little ones by teaching them self-love and the feelings of pride regarding their culture and class. Gently treat the prejudiced attitude. Relate different stories about racism during discussion and help them to cope up the comments of people and enable them to dispute stereotype. It is important to make a peaceful change and justice meaningful to children. Affirm his emotional reactions and discuss ideas with him for dealing with future incidents. So discuss racism with your children and help them grow without any discomfort of differences and inequalities. Although it is not an easy task, it is one of important things that you do for your kids as parents. You can empower your kids by dealing with love and care.